Set in a deliberately ambiguous unconventional family, young Raf learns about getting his timing right. The family in the book could represent a number of real family situations - a poly family, a couple with a donor or surrogate, a blended family with an involved ex, sisters living together, or many other configurations. This book was written with the belief that all children should be able to see their families depicted in the stories around them. Author bio: Sarah J Corner is a qualified early childhood educator, mother and author. She studied a dual Bachelor degree at Melbourne University and has taught in both early childhood and primary school settings. Sarah has a particular interest in writing and advocating for polyamorous families, rainbow families, split families and other unconventional family structures. 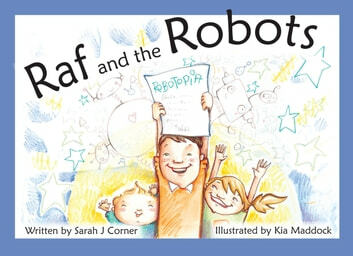 Her first book "Raf and the Robots" is set in a deliberately ambiguous unconventional family, and tells the story of a creative young boy learning to get his timing right. Stories for Unique Families was started by Sarah as a way of contributing to the huge task of representing diversity in children's books, particularly in the areas of gender and sexuality. Sarah lives with her very own wonderfully unique family in the inner northern suburbs of Melbourne. When she isn’t writing Sarah enjoys travelling, dancing and taking her daughter for rides in her cargo bike. Illustrator bio: When Kia Maddock was a little girl she was more often than not found drawing pictures and creating fun-filled art works. This childhood passion has now blossomed into her career in children's book illustration. Her published works include 'The Girl with the Golden hair', 'Silly Sausage', 'The Little She-Wolf'' and now 'Raf and the Robots.' Kia's style is uniquely versatile from the fun, simple and quirky to the mystical, beautiful and detailed. You can visit her etsy shop 'DearKia' to discover her whimsical side. Kia comes from a family of artists and is often buzzing with inspiration and creativity, pouring lots of love and energy into creative endeavors such as funding her travels by painting murals as she goes; and designing and creating toys from recycled materials. Most of all Kia enjoys creating picture books with her three year old son, Toshi, who comes up with the wonderful words and instructs her on what to draw next. Their books include 'Book' and 'Meow Meow Cat Meow'. Toshi is her greatest source of joy and inspiration. Kia is also greatly inspired by the work of Rudolf Steiner and weaves her understanding of nurturing imagery for children into her illustration work wherever possible.